Why Use A Mobile Groomer? There is a growing trend in the pet industry towards mobile dog grooming. Most of us don’t have the time to be loading up our pets and taking them to the salon. Jim’s Dog Wash comes to you and the benefits are many. Your dog’s anxiety will be lessened as they are groomed directly outside their own home. Your dog may become anxious surrounded by other loud, barking dogs in a salon. Not so, with Jim’s Dog Wash. Your dog is our only customer. 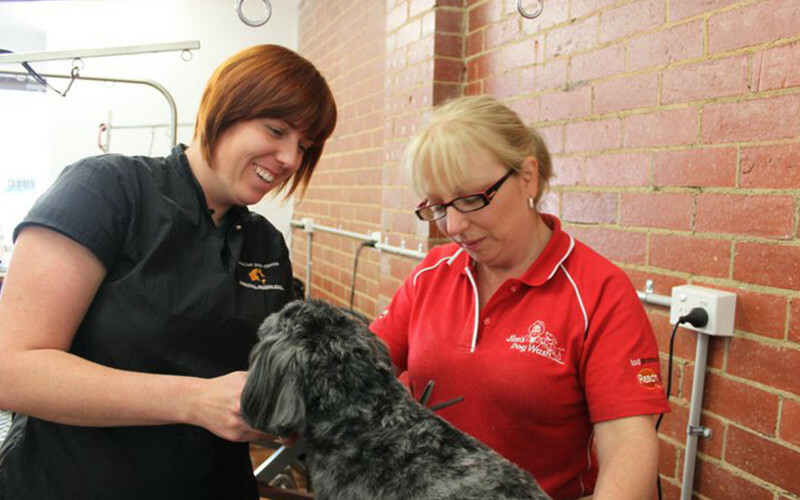 Your Jim’s Dog Wash Franchisee will be the only one grooming your dog, enabling them to build trust. Jim’s Mobile Dog Wash uses a high velocity drier. This can help with deshedding. You don’t even need to be home. Come home from work to a fresh, healthy and clean smelling best friend. To organise a free quote, call 131546 and your local Jim’s Dog Wash Franchisee will be in contact.